I’ll be the first one to tell you that anytime you can pull off a slow cooker meal, you absolutely should. 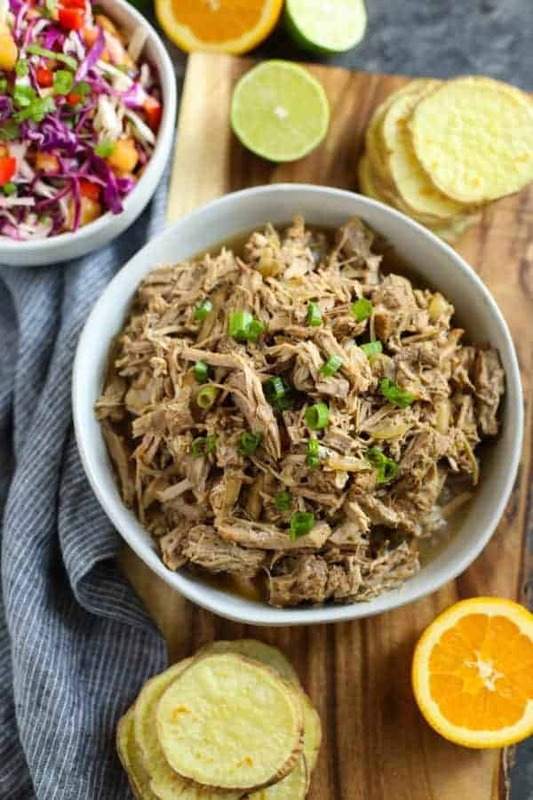 I mean the Instant Pot is super handy for last minute meals but when it comes to cooking down a big hunk of meat into a pile of mouthwatering amazingness, the slow cooker can’t be beaten. Cooking larger cuts of leaner meats low and slow allows flavors to really develop. And, your house will smell amazing which does wonders for priming your appetite. 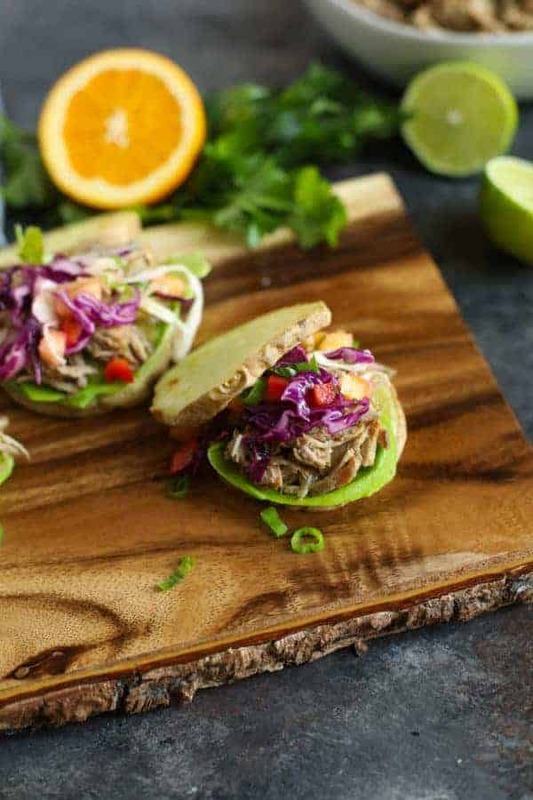 Not that you’d need much convincing to dig into these Slow Cooker Citrus Herb Pork Sliders with Pineapple Salsa Slaw. But in case you do keep scrolling down. I think I’ll have you convinced soon enough. 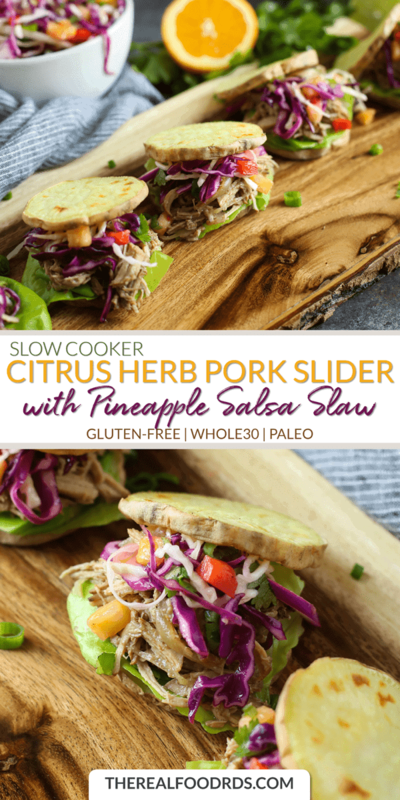 Opting for a clean, Whole30-friendly sauce like the Citrus Herb Cooking Sauce & Marinade from The New Primal makes these Slow Cooker Pork Sliders with Pineapple Salsa Slaw incredibly easy and delicious. I love that it doubles as both a marinade for meat, chicken and fish but it’s also great for whipping up a last-minute stir-fry or skillet dinner. Bonus points for this Citrus Herb flavor because the pineapple juice used to sweeten it also acts as a meat tenderizer. Cut the meat into big chunks, about 3 inches by 3 inches. This not only cuts down on the cooking time a bit but keeps this relatively lean pork shoulder from drying out. Also, cut cutting the roast into pieces you increase the surface area of the meat so that more of it comes into contact with the citrus herb marinade as it slowly cooks amidst a sea of sweet onions and garlic. 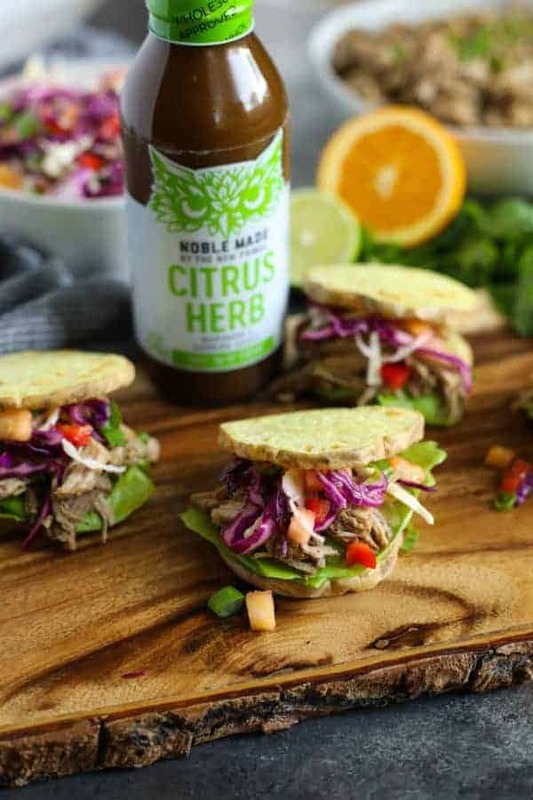 Lucky for you, these Slow Cooker Citrus Herb Pork Sliders are 100% Whole30-compliant thanks to the fact that all of the cooking sauces, dipping sauces, and marinades from The New Primal are Whole30-approved. “Sal-slaw”… that’s a thing, right?! See what I did there? I combined two of my favorite foods to make a new one. Salsa + Slaw = Sal-slaw. 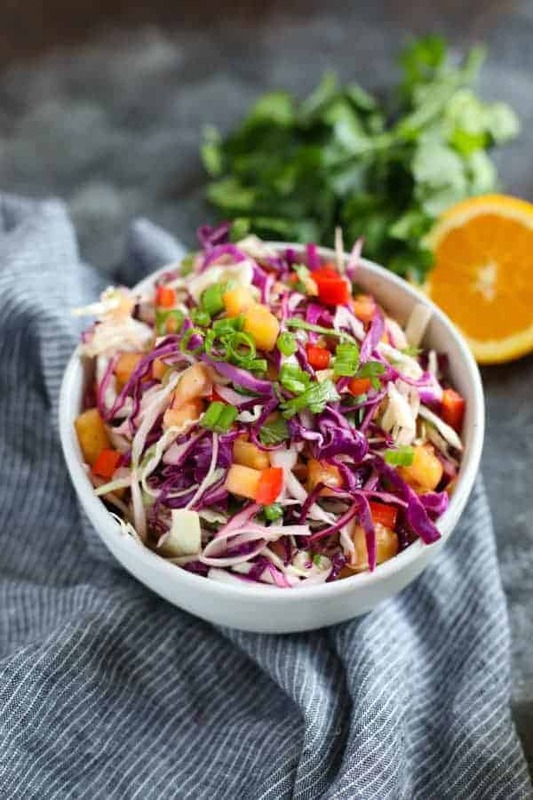 If I were on death row and had to pick a final meal I’d consider asking for pineapple salsa (don’t worry, there’s no chance of that – but if I was, it’d be close to the top of my list) or some kind of slaw because I love slaw of all kinds on everything. 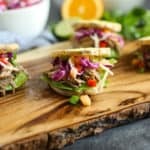 Like this Instant Pot BBQ Pulled Chicken, this Slow Cooker BBQ Beef, these Sonoran Hot Dogs with Mexi Slaw, this Slow Cooker Peach BBQ Chicken, with these Instant Pot Babyback Ribs, oh, and all by itself as this Creamy Broccoli Slaw. Clearly, I’m slaw obsessed. 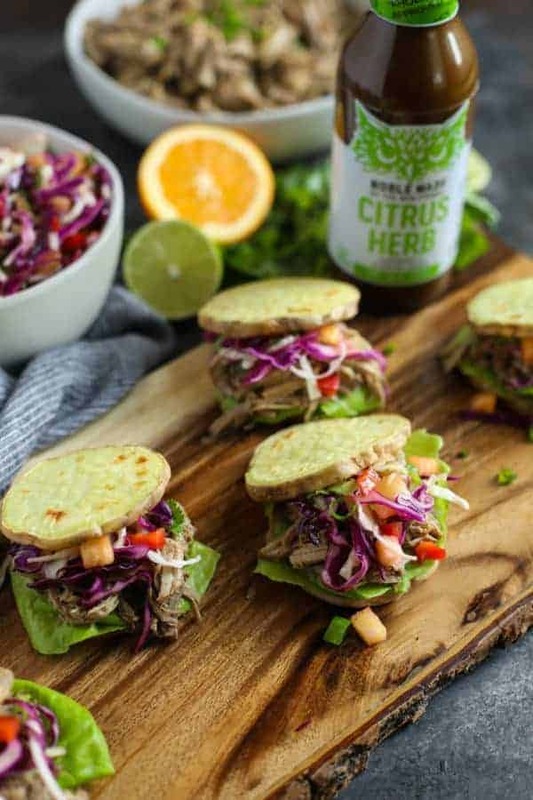 But all kidding aside, if you do nothing more this week in the kitchen – make these Slow Cooker Citrus Herb Pork Sliders and top them (no, douse them as I do) with the Pineapple Sal-Slaw. So good!! The sauce AND the pulled pork…. So easy, just add it all to the slow cooker and come back later. Make the pork during your weekend meal prep. Chop the veggies for the slaw and mix up the dressing but wait to toss them together when it’s time to eat. Prep the pork, onions and garlic and store in the fridge for up to 3 days. When it’s time to cook, add pork, onions, and garlic to the slow cooker along with the Citrus Herb Cooking Sauce & Marinade then cook for 6 hours on LOW. Assemble the slaw just before serving. And the slaw? The slaw will keep in the fridge for up to 3 days though it may become a little watery and lose it’s intensely bright colors – but it’ll still be delicious! Place sliced onions in bottom of slow cooker. Place pork on top of onions. Sprinkle with garlic, salt and pepper. Pour Citrus Herb Cooking Sauce & Marinade over all. Place lid on slow cooker and cook on LOW heat for 6-7 hours or until pork is tender and shreds easily with two forks. Shred pork and keep warm until serving or cool and store in the fridge until ready to use. Combine cabbage, pineapple, bell pepper, jalapeno, green onions and cilantro in a bowl. Whisk together lime juice, avocado oil and salt. Pour over slaw and toss well to mix. Wash and dry sweet potatoes. Without peeling, slice into 1/4-inch thick rounds. Bake sweet potato rounds at 375℉ on a parchment paper-lined baking sheet for 15-20 minutes or until tender. 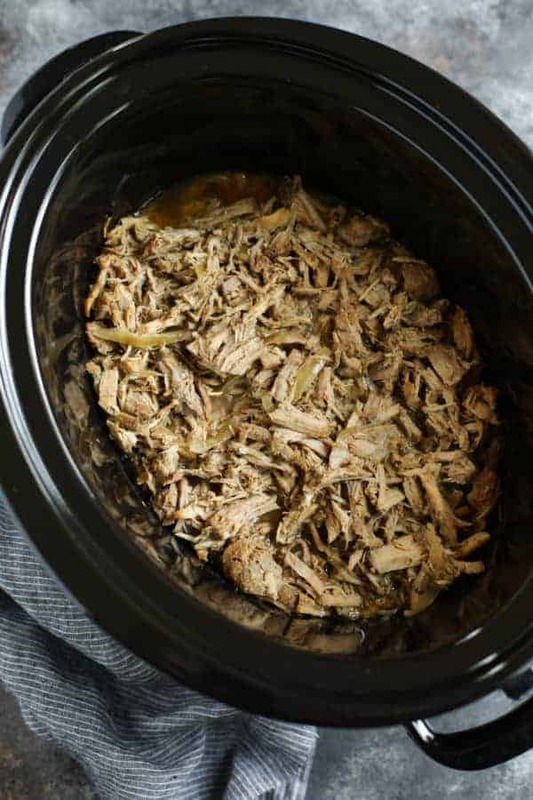 What’s your favorite slow cooker meal? Are you also a huge fan of slaw? Share in the comments below! 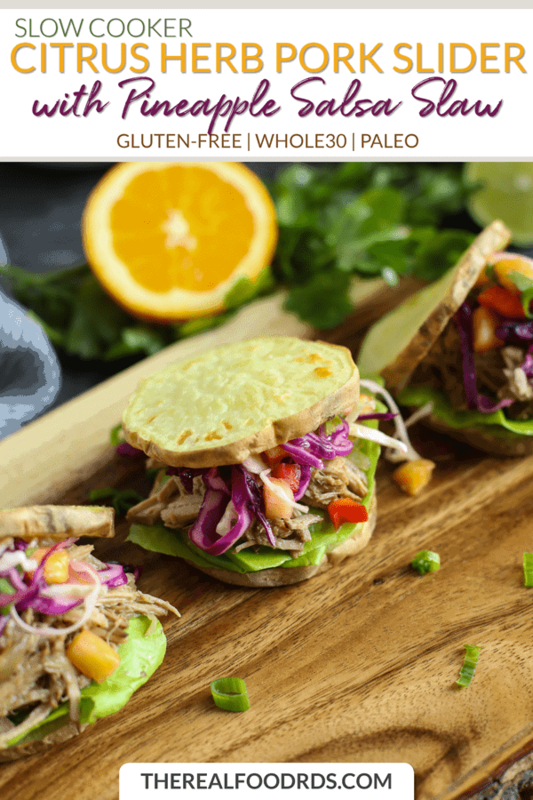 This post was made possible by our friends at The New Primal. Although we received compensation for this post, the opinions expressed here are – as always -100% our own. Thank you for supporting the great companies we work with thereby allowing us to continue creating great recipes and content for you.